Konnor joined the team September 2017. He is responsible for day-to-day client maintenance as well as assisting in review meetings and the financial planning process. With his creative mindset and attention to detail, he is the go-to person for many projects around the office. Konnor is always willing to assist in taking on new tasks and with his knowledge and versatility, he proves to be a vital asset to the Infinity Wealth Alliance team. He is working towards obtaining the CERTIFIED FINANCIAL PLANNER™ designation which will allow him to take on more responsibilities. 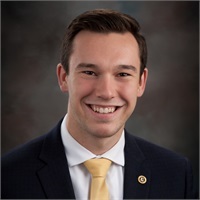 Konnor graduated from Gustavus Adolphus College with a bachelor’s degree in International Management. After graduation, Konnor joined the finance industry working with Vanguard. Konnor holds the Series 7, 63, and 66 securities registrations held through LPL Financial and his Minnesota Insurance license. Konnor grew up in West Des Moines, Iowa, and enjoys playing and coaching soccer. He appreciates outdoor activities and loves drawing, painting and photography. Konnor has been involved with youth mentoring since 2013 and likes giving back to the community.